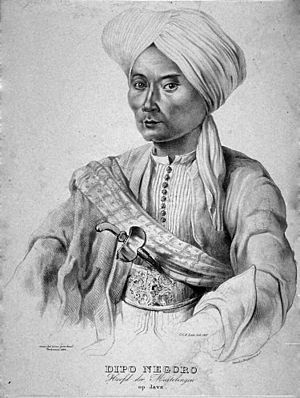 Diponegoro was a Javanese prince who opposed the Dutch rule in Indonesia. He was the eldest son of Sultan Hamengkubowono III. Diponegoro was born at Yogyakarta in 1785 and died at Makassar in 1855. During the Dutch rule, a ruler like his father had lost many rights such as the ability to lease land. Instead, he was paid by the Dutch to keep peace. This was an indignity to his father. This led to an open battle headed by Diponegoro himself using guerrilla tactics, which was called the Java War. It lasted for five years, from 1825 until 1830. During that period Diponegoro had successfully led battles, ambushing Dutch camps and raiding food supplies. Over the period of five years, more than 200,000 people were dead because of the war. In 1830, he was sent away by the Dutch to Manado, then moved to Ujungpandang, and he spent the rest of his life there. After being held by the Dutch in Fort Rotterdam in Ujungpandang for 25 years, he died there in 1855. Diponegoro Facts for Kids. Kiddle Encyclopedia.